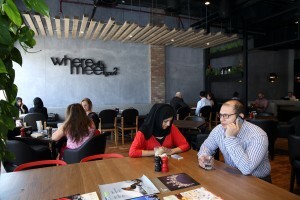 The Coffee Club, Australia’s largest café chain, and Liwa Minor’s first franchise brand in the UAE debuted in January at Abu Dhabi’s Yas Mall, with a rapid succession of further openings at Dubai’s Wasl Vita Mall in March;Sheikh Zayed Grand Mosque in Abu Dhabi in June;andDubai Airport Free Zone in July. Since its inception in 1989, the café group owned by Minor DKL Food Group, a leading Australian retail food brand franchisor, has expanded to 360 cafés throughout nine countries including Thailand, Egypt and China. The chain that serves more than 40 million cups of coffee to its approximately 30 million customers annually, is well known for its all day breakfast and interiors which serve as a relaxed meeting place for patrons. Overseeing the arrival and expansion of the group ino the Middle East is recently appointed CEOof Liwa Minor Food and Beverages LLC – a joint venture between the Thai based Minor Group and the Al Nasser Holdings Group –Paul Smith. Speaking exclusively to Catering News ME, Smith says he hopes the joint venture will become one of the most recognised F&B businesses in the region, measured by customer engagement, operational excellence and people development. Smith comes into the role with a track record of delivery in PLC, Joint Venture, privately owned and W.F.O.E businesses in addition to a reputation for business development, especially in highly culturally diverse, complex international environments. His previous experience includes roles at Thailand based The RMA Group; MENA, Russia, China and south east Asia-based Costa Coffee; Kuwait-based M.H. Alshaya; and UK based Marks & Spencer. “The UAE is full of opportunity, we see new F&B concepts being launched on a daily basis giving customers huge choice and variety. We need to ensure that the foundations we establish give our customers a great choice of quality brands, outstandingly operated with exemplary customer service; and I’m excited to be part of that,” said Smith. “Having worked in new market launches in the MENA region, Russia, China, Myanmar, Thailand, Cambodia and Laos, the UAE stands out as having a great foundation of café culture that is already very much part of the country’s heritage. “The UAE has the highest per capita number of F&B outlets in the world, with 55% of all global brands represented here. With 16,000 more stores expected before 2019, the trick is to differentiate ourselves. “It is not about brands any more but about positioning and how you serve and those businesseswhich continue the brand route will fail. Although it was heavily brand centric before, the region is now more concerned with the service. In casual dining you have to offer a fine dining experience to win,” argues Smith. In addition, Smith suggests that with the high rent rates in the region and high labour costs, in terms of advertising, recruiting, transporting and the issuance of visas,operators need to “sweat assets” with all day solutions, for breakfast, lunch and dinner. Liwa Minor has an exclusive franchise agreement for The Coffee Club throughout the Middle East, and is committed to open 60 stores across Gulf in the next five years, expanding then into North Africa and eventually to South Africa. “The Coffee Club will get to a point of six to seven stores by the end of the year in the UAE – balanced across the Emirates. We want to learn so we will sedulously absorb what we can in learning from the market. 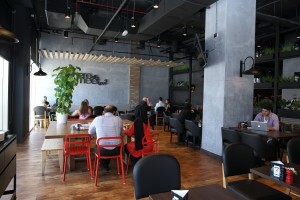 Speaking about the initial launches of The Coffee Club, Smith adds: “The Vita Mall store on Al Wasl road in Dubai has been brilliant, very quickly developing a good reputation with customers. In Yas Mall we have a great location but we’re probably two years ahead of the curve with the residential around there. Although we hit all targets at the weekend, we are having to sweat the weekend asset to pay for weekday costs. And the mosque is a complete unknown. Moving forwards, focus will fall to Kuwait, leveraging off Liwa’s established retail business there, followed by Bahrain, which in itself will double up as a testing ground for the Saudi Arabian market, with Damman only a short drive away. In turn this will pave the way for expansion into Jeddah and Riyadh. “Because of the strict segregation laws in Saudi Arabia we need to get the offering perfect and not rush in. Qatar is an interesting proposition too, although it’s notoriously difficult to get food in because of its own regulatory framework,” Smith continues. Smith has three differing store formats to deploy for The Coffee Club from a full restaurant, to a reduced menu offering and a grab-and-go kiosk concept, although the initial priority is full-sized full-experience outlets. Having worked extensively in coffee – launching Costa Coffee in the UAE, Russia and China, Smith has a clear understanding of what clients are looking for. All food is prepared on site,freshand unfrozen, and regional offerings will capitalise on the international popularity of breakfast menus, which include eggs benedict,a burger or even a Thai dish. Specifically for the Middle East market a desserts menu will be launched with “the sweetness dialled up”. But the coffee shop concept in the local market is a road well-trodden. Since 2010, the UAE has been the fastest growing market by volume for coffee in the world. According to data from Business Intelligence Middle East, total coffee volume sales grew 80% from 2009-2014 with a CAGR of more than 12% over that time period. 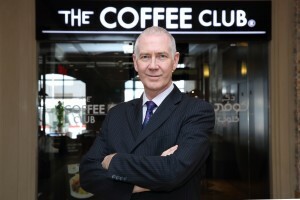 When asked how The Coffee Club will stand out from the already established chains like Starbucks and Costa Coffee, Smith says: “Having worked for Starbucks and Costa I know this is a different proposition. Aside from The Coffee Club franchise, Smith is looking at new concepts in Italian, Thai and Chicken food. While new to this region, all these concepts exist in their own geographical markets and perform very well in pressurised, highly competitive, prime real estate markets. “They have had to think about their position and how to sweat the asset,” adds Smith. Aside from reinventing the region’s QSR offering, Smith is also very keen on the training and development of young people in the region. He adds: “I found a company out here with a big data pool of people within one or two years of a degree looking for traineeships or internships and I’m really keen to tap into that young talent to give people an opportunity. Rather than go to the traditional market I willlook for some bright young talent and see if the relationship can work. Giving people a chance is important today,” he adds.